Figure 1. The "Lots of Space" section has numbers that constantly become larger values. 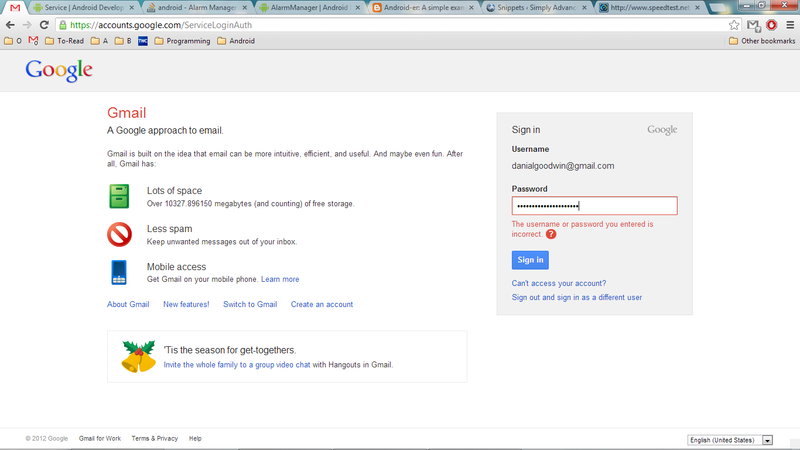 Metaconclusion: But, I think they don't actually give every single Gmail account more space every second. More realistically, they just give the extra space once a year, and no user complains about having a little extra space. But, the process can be made even better. 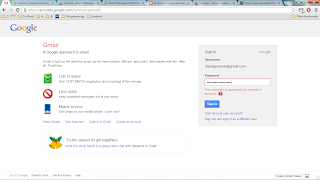 Those who don't keep their Gmail accounts constantly full to capacity never get an increase, until they actually need it. This saves many unnecessary processes. Figure 2. Mid-left, you will see I currently have 10.1 Mb of space available to use. Lifehacker is probably the best site to find productivity hacks, clever uses for items, and many other interesting topics that tend to make your life better. Today, I am going Lifehacker-diving again. A term that I just made up as I wrote the sentence down. It means that I am going to open up a whole bunch of different articles in different tabs, then just read through them all and possibly follow links to other websites. Something I thought about doing before is just pasting every single article/link that I read. And, maybe, I'll precursor each of the titles/links with a plus or minus sign as my suggestion, and 0 for neutral (aka depends on reader preference). If the title isn't apparent in the URL, only then will I write it out. Jk, just made a new folder for the rest of the tabs. I think I will try to do another post like this one. At least until I finish up all the ones I opened today. Wow, I haven't done this much lifehackering in a very long time. Feels Good. And now it's time for sleep. I lost two hours of sleep reading through all of these articles. Hopefully, a lot of REM so that these readings stay stored in my head. ps - One conclusion that you can draw from this elongated list of links is that, if they all have one thing in common, then it would be that I'm interested in that topic. I'd like to hear other people's thoughts about the list. First thing, a little blurt about the number in the title. It is the date format that I'm using and liking very much to organize all of my folder and files. They are all automatically sorted in chronological order because of the name. One example, I used to label my school folders as "USF 2012 Spring" and "USF 2012 Fall" and "USF 2012 Summer." But, first of all it is not in an efficient order. And secondly, it doesn't look very neat. Within the past six months I've transitioned everything to the style of "USF201201", "", and "". It is more efficient, neater, and doesn't lose much readability if you can recognize the 2012 year in there. A rollercoaster ride that feels like it is broken (and may fall at any moment). When there is a real problem with the ride (how would they know? ), the ride tells the potential riders that workers must break the ride more before riders can ride again. Full theme park that is purposely seemingly empty. Some park goers are actors/hires (theme park goers would never know about this part). Couples may want to team up randomly in the park with others so that they are not totally alone, but that might just be their mistake. Are there fish ball/cages like there are hamster balls/cages? Maybe the fish can learn to travel by shifting their weight? Dubstep without echo is kinda like classical music. And vise-versa. Write a book called, "Dan Writes a Book"
 Proxy for Twitter API calls. Twitter limits the number of calls a day from an IP, but if you keep switching the IPs when they fail, then you have have a whole lot more available API calls. This service can be made into an API. Cloth that you can put on when you are wet, and stay dry and warm without worrying about the inside of cloth getting/staying wet. Clothes that don't turn inside out in the wash. A temporary solution would be to either stitch the main (large) opening clothes, or by just using a pin to keep it closed, that way the smaller parts of the clothes won't be able to go through and turn the entire cloth inside out. 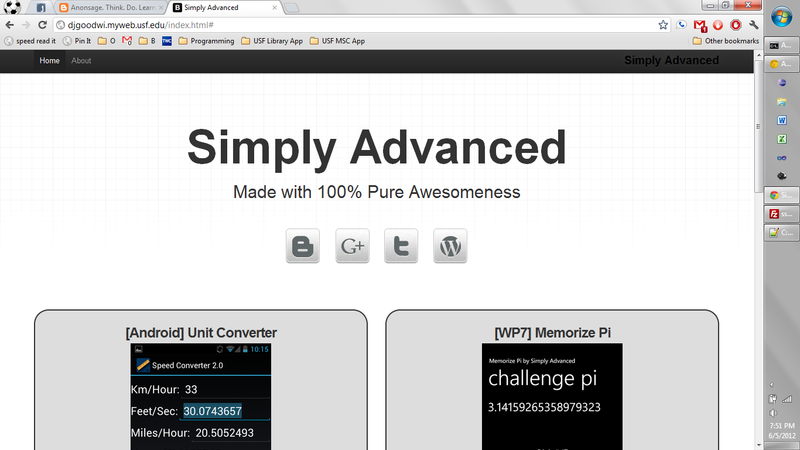 App using Windows live tiles: Simply Advanced Countdown Tile. 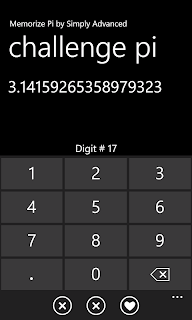 Days until whenever.. Or weeks until whenever.. Or years until whenever.. Ability to add picture relating to event like birthday, holiday, anniversary..
 App for Windows 8: A piano lock screen. Play a song to unlock the screen. Future version (or paid version) would include different instruments. App: Top-down, zoomed out game. In order for your avatar to get from one town to another, the user must actually go on a physical run or walk for a certain distance to get there. Start off with small distances, gradually get longer for more advanced areas of the game. Going to do dishes in the sink? Then get energy back from the water you use! Same for shower heads, or any other place that you run water. Perhaps the base of a hose line? Feel free to comment, email me, make use of these ideas (let me know how it goes), or brainstorm other things from these. Please try not to draw conclusions from this post, it is purely a thinking exercise, half of it unconsciously thought of. 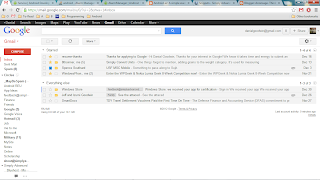 Words in square brackets, , are what I added at the time of writing. ps - Doing this also allows me to clear out much of my ideas folder, thus, forcing me to come up with new awesome random things. The several ideas I didn't share are ideas are ones that I have for a thesis/paper that I'm currently working on. They will be shared in a year or few. Here's a link to an old blog post of mine, for the top five predictions of 2012. I realize that the paper, "Minesweeper is NP-complete" by Richard Kaye, was first published in 2000, but the idea is new to me! I just found out about it yesterday when doing background research for a new app idea. So, basically, Richard Kaye knew Minesweeper was hard, but wasn't quite sure how hard. He arranged mines on the board so that they would simulate logic circuits (AND, OR, NOT...). He then correlated the logic circuits to a previously-known NP-complete problem, SAT. I found a version of Minesweeper online that allows players to write Java code in order to solve the game, but unfortunately, it doesn't appear to be working. The reason I'm probably interested in this is because when I learned how to play this game many, many years ago (before I was programming), I started to write an algorithm for it. I thought, an algorithm is the perfect way to teach somebody how to do something -- it is all very logical. I shouldn't have to explain more. "Minesweeper is NP-complete", Mathematical Intelligencer, vol 22, number 2, pp9-15, 2000.
ps - I'm very likely going to create apps that revolve around Minesweeper now. Actually, I was already considering it. That's how I found out about the NP-completeness. Ever get the feeling you're being watched? It'll pass, because you know for a fact that you are being watched, it is the future after all. The future of work and productivity will include no filling out of punch cards or time sheets. Cameras with facial detection algorithms can easily recognize different faces. High resolution cameras can even read your fingerprints from across the room. These two technologies will detect entering and leaving of a facility. But, what about actual work? Employers want to know if employees are actually working or sleeping at their desks (sleep may be a good thing, just like watching kitten videos). Many companies (including Toyota, Ford, Volkswagen, Daimler) are working on algorithms to detect when a human is tired, excited, or other range of emotions. This technology can easily be applied to workstations to know whether or not people are facing the proper working direction (computer or assembly line) and if their eyes are closed. Published new Android app, LTE Discovery! It automates discovery of new LTE coverage for Sprint, AT&T, Verizon. It automatically cycles airplane mode every thirty seconds in order to detect the faster network. If you don't have this app, then your phone will only check once every thirty minutes. Tomorrow, I'll be releasing LTE Discovery for Android. It automates everything you need to do to detect new LTE towers around you. The app will cycle airplane mode on and off every thirty seconds, for the first version. Then, each time LTE is detected, your current GPS coordinates will be saved for easy reference. Just created a hotkey to double-click so that I don't have to use the mouse! It is very much worth it and will speed up coding. There are other areas that I will be more productive in also. Just can't think of them right now. I used an awesome program called AutoHotkey to achieve this and many other create keyboarding shortcuts/hotkeys/scripts. The following code basically says, "if ctrl is pressed twice consecutively in less than 500ms, then click two times at the caret position." Instead of using "%A_CaretX%,%A_CaretY%", it is possible to hardcode an x and y value to click on. If you remove the line starting with MouseMove, then the cursor will move to the position the caret is at. Disclaimer: I have not done an extensive test on all programs to see if this works. But, I know that it works in Notepad++, Eclipse, Notepad, and MS Word 2010. While typing this, the hotkey seems to return (aka double click) the top-left corner. At the time of this writing there are no shutdown tile apps in the Windows 8 Store. Window's shutdown.exe can be found in %windir%\System32\ (typically, C:\Windows\System32\). Double-clicking on that will start the shutdown process. Point it to "shutdown /a /t 00"
Problem: I have to work with many groups of people and give presentations with them. A few members don't speak up so that the entire room can hear them. Solution: My suggestions have been to practice presenting outside at least five meters apart from each other. Another suggestion is to make everybody in the group wear large headphones. This will force everybody to speak up and get used to speaking louder. Please, somebody prove me wrong. Show me an easier way to highlight text in PowerPoint 2010. It seems more amazing that our ears can pick up vibrations that happen around us. More so than just saying that we can hear. It's not my fault that my brain decided not to remember _______. EDIT: "I tried, but my brain took over." EDIT2: Dang conscious thinking not as smart as sub-conscious thinking. EDIT3: "The brain didn't name itself, I did." EDIT4: Talking to myself too. Riddle: How Many Women May a Man Marry? Q: How many women may a man marry? In the weekly email I get from Quora (a great Q&A forum, possibly the best), I decided to answer one of the questions posed, "To be happier, what's the smallest, simplest thing an average person could do?" Let me know your thoughts too. When people want Windows OS on a Mac they may think of dual booting or using a program like VMWare, VirtualBox, BootCamp, or Parallels to run the two simultaneously. But, my roommate (Spence) and I experimented with another method to run Windows 7 and 8 on a Mac. We would replace the Mac's harddrive with the harddrive running Windows OS. Both were 2.5 inch. What got us thinking on this track was that, first of all, the Mac wouldn't boot after being dropped. Us being computer savvy individuals, we didn't have another Mac lying around, but we did have an older Lenovo laptop that we thought we could possibly salvage parts from. We took out the Mac harddrive, took out the Lenovo harddrive with Windows 7 and 8 dual booted, and swapped them. The process took less than ten minutes to figure out and complete. Windows 8 runs beautifully on a 2009 aluminum uni-body Mac. Both Modern UI and desktop versions supported. And we were surprised that the Wi-Fi was easily connected to without installing any additional drivers. Initially, the trackpad only partially works (movement only, no clicking), but an external mouse does work flawlessly. Clicking and multitouch were added by installing the proper drivers for them. There may be a few more issues, but this is just a preliminary rundown of our experimental harddrive organ transplant. If you also do a harddrive transplant, let us know! You can download some of Apple's drivers [at your own risk] from http://www.2shared.com/complete/J5_Inbmt/Apple_folder_from_Boot_Camp_Wi.html. 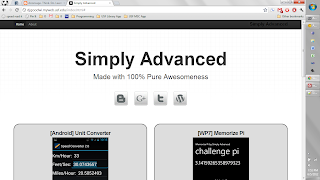 Finally, there is a new post on my blog.SimplyAdvanced.net website. The last one I wrote was on 31 May 2012. The Android development problem I talk about is the issues with the camera preview within onPreviewFrame() and setPreviewCallback(). The same code that worked for Android 2.2 didn't work for 4.0 and above. The desktop application I am talking about today is Sticky Notes that comes standard in Windows. I used to think that Sticky Notes was a featureless program. But, one day I decided to try out some formatting shortcut keys that I typically use in other Windows products. So, then I discovered that the application supports Ctrl+b for bold, Ctrl+e for aligning text to center, Ctrl+Shift+> for increasing text size, and more. This has made Sticky Notes much more useful than before. I used to think that just writing on paper was the quickest way to keep notes and a todo list. But now, for efficiency, I use just one large Sticky Note on my desktop. This has the added benefit of not having to throw away physical paper. I'd like the chance to answer any questions. VLC is the best media player in the market that plays just about any type of media file. But, one big flaw is its browser plugin. When it is running, there are no extra options to do anything with the media file. 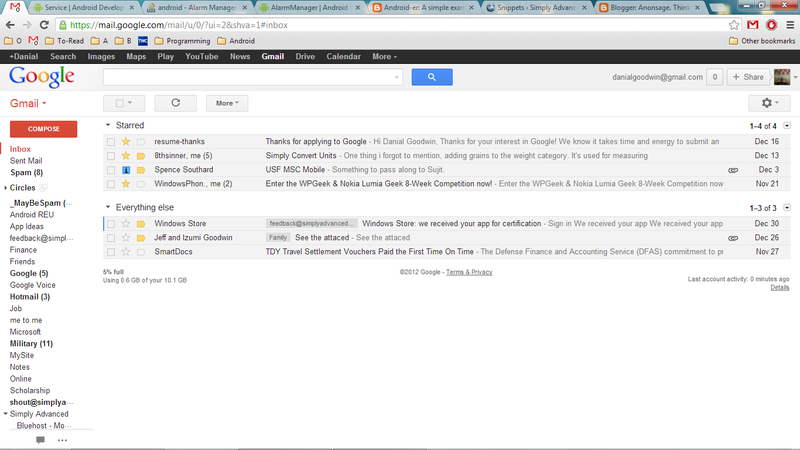 type "chrome://plugins/" into the address bar (or omni bar) located at the top of Google Chrome. Search and find "VLC Web Plugin." Click on the "Disable" link. You are done. There are no options in the desktop part of VLC to disable the web plugin. But now, you know how. Google Chrome will now try to use another media plugin you have, or it will try to download the file. To me, productivity is creating things; it's not not not creating things. I answer a question with "I don't know" even though I may know the answer. It is a subconscious question, "Does it really matter?" and an unconscious implicit "It doesn't matter." I never really knew about these types of questions until I thought of it today. This is just a continuation of me trying to harness my subconscious mind by having the ability to think with it more. Meta-thought is where it's at. Explicitness is more beneficial, "I believe you know the answer if you think about it a little more." Maybe this has been obvious to you all the time, but I think it is actually too obvious to state out loud. Does this make you think at all? Two nights ago I had a three-part dream. I don't really remember what the second two parts were about. But, the first one more than makes up for it. The dream was about myself rolling around in my shoes, like Heelies. I was going everywhere in them, including class, through stores, and in my apartment. Sometimes I would get a running start before gliding across the world. It was cool to be in them. Though, I didn't see anybody else in the dream wearing them. I could imagine a world where everybody had Heelies. I can definitely see myself in shoe wheels. Airlines typically overbook their flights because they know there will always be people who cancel, and the airlines want to ensure that they have all the seats full to get maximum profit. Well, how about airliners sell two types of tickets, a refundable kind and a non-refundable kind. The refundable tickets would be marked up at a higher price to ensure potential passengers peace-of-mind, knowing they could get 80-90% of their money back if something came up at the last minute. Also, airliners wouldn't have to worry too hard about filling seats because each of them are already paid for. I'm not sure if they do this already, does anybody know? 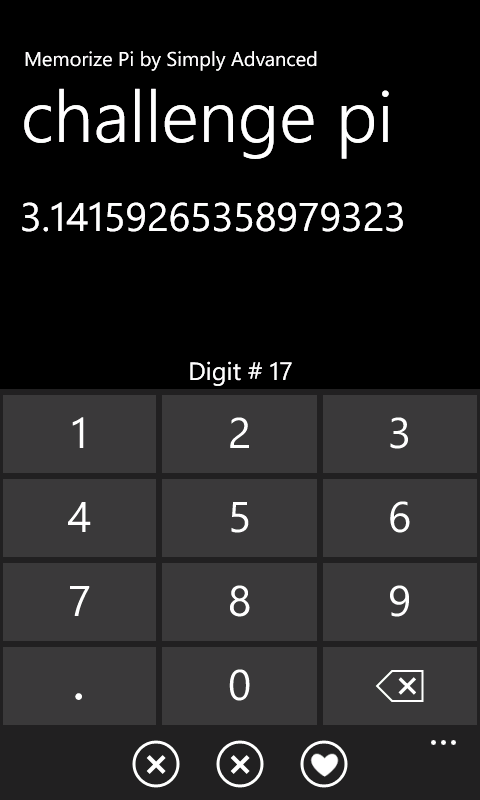 With the help of my personally create MemorizePi app for WP7 I have successfully memorized 153 digits of pi! 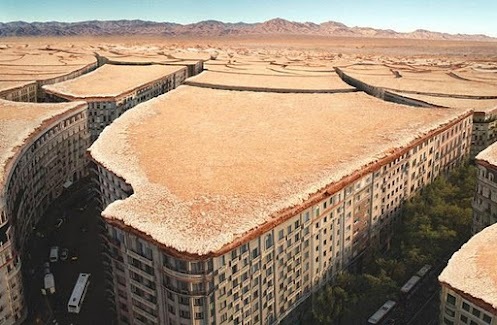 Everyday that I'm breathing, I will be environment-friendly. "If you're early, then you're on time. If you're on time, then you're late." Sometimes I think about how fake the sky looks, kinda like a great painting on canvas, but I always come to the realization that it is awesome that the sky is real and never ending; I'm not going to run into the sky like in The Truman Show. It just popped in my head that groovy purple is a great color.